Here’s the beginning to a whole new era for every Indian motorcyclist worth his leathers, for Harley-Davidson’s here. Now, instead of lusting over posters of bikes such as the venerable Fat Boy adorned on bedroom walls, be ready to hear the rumble of big-bore v-twins chug through the streets of India. It’s about time, especially since the Japanese big bikes are already here. H-D has been waiting for the right time to ride into town, and it seems like the company thinks that time is right about now. Slated to start selling its metal steeds by 2010, the bikes will be imported into the country as completely built units, along with the accessories and riding gear that complete the overall experience of riding these machines. What started back in 1901, the company has come a long way since the first drawing for a bicycle-mounted engine was completed by a 21 year old William Harley. William and Arthur Davidson unveiled their first production motorcycle, a racer, to the public in 1903 from a little wooden shack. Arthur’s brothers, Walter and William, soon joined the Harley-Davidson Motor Company and the legacy was thus born. Harleys are synonymous with big V-twins, although having started with singles and dabbled with them later as well. The first H-D V-twin was introduced in 1909 and produced a whole of seven horsepower, which was quite healthy for that era. Many iconic bikes followed, some of which include the ‘Knuckle Head’ — named so because of the shape of the valve rocker covers and the WLA that served in World War II. 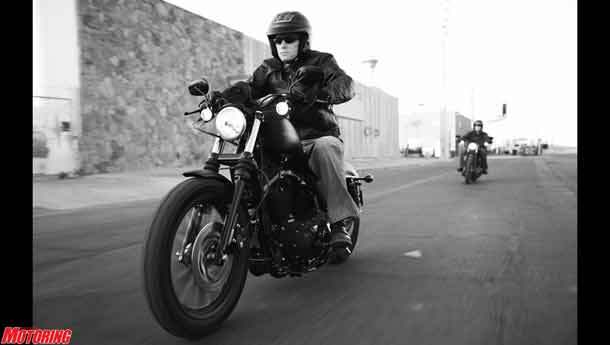 Harley Davidson is into leisure motorcycling and that ethos shows through brightly in its motorcycles. The ride is an event to be savoured and not just another way to get around. Individuality is highly encouraged by this marque, with a heady array of aftermarket parts which are marketed under the ‘Screaming Eagle’ brand name and the thirst for that biker look is satiated with a large helping of H-D branded apparel and accessories. Customisation is rife and the chrome is blinding, but many ardent fans love to slurp in large helpings of the stuff to keep the company churning out more motorcycles as the years go by. If you’re the kind that savours missile-like performance, look elsewhere for Harleys are built the old fashioned way, and it prides itself for that. Push rods actuate basin-sized valves that feed two obese and hungry pistons that lazily go about doing their business of making power. Hogs may go slower, but that lets you see things around that you normally wouldn’t riding a manic sportsbike. Harley-Davidsons never sell for cheap and so it’s unlikely that we are going to all dump our piddly commuters for big American iron immediately. Although purely speculative, be prepared to shell out anything from between 10 to 15 lakh rupees to get one home. That’s a lot of money, but a large chunk of those notes are all thanks to prevalent duty rates for the import of CBUs. But for many, the price is never too great to savour the ‘potato-potato’ gurgle of a big Yankee V-twin.